Listen to the full story below or read the transcript that follows. Very moving stuff.. I grew up in a non religious family and never went to Church. The most exposure I had to Christ was at a church of England primary school as well as my grandparents who are Christian. I’ve always held the belief that there was something more to life than the physical, but I wasn’t Christian. My cousin and now Godfather James, who’s here today, in the summer of 2016 showed me a video that was the spark of my conversion. James was looking at talks of various Bishops and Priests, and I was intrigued at the way they spoke with such passion, authority and love for God, the Church and its people. I started to look into the sermons myself online and learned something new every time. A particularly significant person was Archbishop Fulton Sheen, whose sermons were amazing and very helpful. Then at Easter time in 2017, my now Godfather, Justin took me and James and another one of my friends who’s here today, Marcell, to our local Catholic Church, Sacred Heart, Hook. We didn’t make it in time for mass but we did knock on the door of Fr Peter Codd next door. Fr Peter gave us each a small Bible and opened up the Church and showed us the stations of the cross and what the various things in the Church were. This would be the first time I set foot in a Catholic church. Then that summer, my Mum, Brother and I went to Rome, as we have family over there. It was one of the best holidays I’ve ever had, the Vatican and all the art and statues around Rome of Saints and Angels were very inspiring. And that’s when I had the idea to join an online Catholic group where I could talk to thousands of other Catholics of all ages about the faith. There were even people in religious orders, seminarians and a deacon on there to speak to. I asked them dozens of questions about the faith and this developed my understanding of the faith significantly. I watched debates on God’s existence and between many denominations so I could be sure that I was joining the Church Christ founded. I’m still very active on there and speak to the same people everyday and have made good friends. In late 2017 Fr Paul came to our church. Father Paul is a wonderful priest and has been instrumental in helping to guide me in the faith and deepening my love for God. Whenever he comes over to my home he’s always happy to listen to what I’ve learned from others and is happy to answer any questions I have. The Dominican Sisters of St Joseph’s webinar has really helped me understand God message in the gospels, and their dedication to God is truly inspiring. Since my Baptism and confirmation I have experienced so much joy and deeper purpose in my life, and the thought of not being Catholic is alien to me only after one year. Receiving the Eucharist and experiencing God’s mercy in the Sacrament of Reconciliation has truly given me happiness I never thought was obtainable. I love talking and sharing my faith with family and friends and seeing how God is working in their lives. Becoming a Catholic is truly the best thing that has ever happened to me! Lastly, I would like to express my gratitude to God because ultimately it was he who guided me to his Church. So, thank you God for the grace you have bestowed upon me and all of us here today and thank you for showing us the path to your Church, especially the people who are being welcomed in this year. For more on Charles and the wider Rite of Election – please take a look at the Portsmouth Diocese main website. 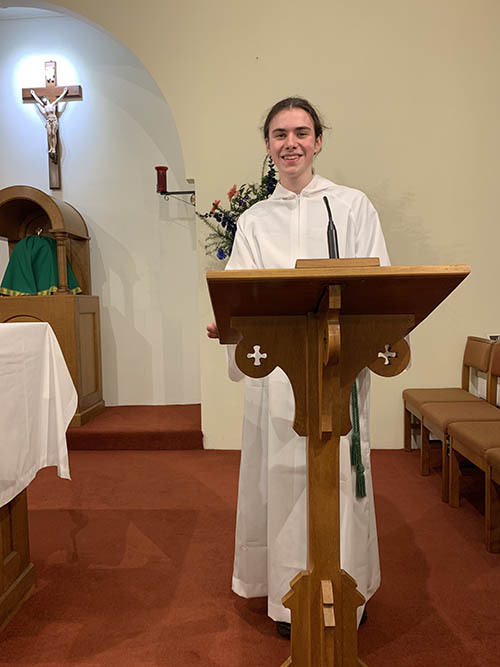 You can also catch Charlie (as he’s more commonly known) serving at mass on Saturday nights at Sacred Heart Church, Hook. Do you have any journeys you’d like to share? Do get in touch or add your thoughts in the comments. Wonderful testimonial Charlie – well done! Super job Charlie – well done!! !